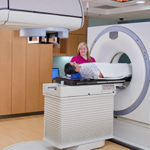 Radiation therapy is the most common treatment for prostate cancer regardless of cancer stage, prostate-specific antigen (PSA) level, and prognosis and risk rating, according to a study published online by JAMA Oncology (2015; doi:10.1001/jamaoncol.2014.192). Prostate cancer remains the most commonly diagnosed solid organ tumor among US men with an estimated 233,000 new cases and 29,480 deaths in 2014. Earlier diagnosis and treatment advances have meant increased use of aggressive local treatments, particularly radical prostatectomy and radiation therapy, which can result in adverse effects. Patients must often consider the recommendations of physicians, the aggressiveness of their cancer, whether active surveillance is preferred over treatment, and health care costs, according to the study background. Jim C. Hu, MD, MPH, formerly of the David Geffen School of Medicine at UCLA, Los Angeles, California, and now of the Weill Cornell Medical College, New York, New York, and coauthors examined predictors for treatment and use of watchful waiting or active surveillance—described as monitoring the disease with the expectation to begin treatment if the cancer progresses—for indolent (less aggressive) prostate cancer. The research, conducted at UCLA, analyzed Surveillance, Epidemiology and End Results (SEER)-Medicare linked data for a total of 37,621 men with a prostate cancer diagnosis from 2004 to 2007. The authors found radiation therapy (57.9%) was the most common treatment followed by radical prostatectomy (19.1%) and other treatments including watchful waiting or active surveillance (WW-AS; 9.6%). Patient demographics and tumor characteristics account for 40% of patients undergoing prostatectomy, 12% choosing WW-AS, and 3% undergoing radiotherapy, according to the results. Radiotherapy was the most common treatment choice (48% to 66%) regardless of stage, PSA level, and prognosis and tumor rating; the choice of radical prostatectomy was influenced by PSA level. The choice of WW-AS was guided by clinical stage, as well as prognosis and tumor rating, while choosing androgen-deprivation therapy (ADT) was influenced by cancer stage, PSA level, and prognosis and risk rating. The authors also found choosing WW-AS increased among patients at advanced ages and those who consulted with a medical oncologist. Asian men and married men were associated with the least likely use of WW-AS. Increased radiation use was found among men with advancing age, more significant co-existing illnesses, and tumor characteristics, and it was most likely used when men were referred to a radiation oncologist, according to the results. “There remains an increased use of treatments in men diagnosed as having prostate cancer and underuse of active surveillance in men with low-risk disease. There is an increased use of radiotherapy among all risk groups and in particular patients with indolent disease with limited correlation according to tumor biological characteristics and patient health. Further research into identifying determinants that drive decision-making recommendations for patients diagnosed with low-risk prostate cancer are needed. These findings must be balanced when considering health care reform initiatives to improve quality of care,” the study concluded.